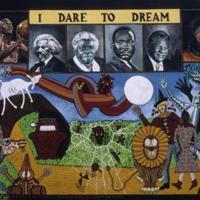 I Dare To Dream is a Chicago mural painted in 1995 by artist Paul Thomas Minnihan. Drawing heavily upon local history, the mural includes locals such as the Chicago Bulls player Michael Jordan, astronaut and first African American woman to travel into space, Mae C. Jemison, and Harold Washington, the first African American mayor of Chicago. Alongside the Chicago figures are the faces of Mary McLeod Bethune, Frederick Douglass and Martin Luther King Jr. 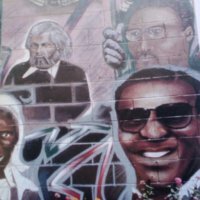 The west side mural was situated opposite the Douglass Branch of the Chicago Public Library, but no longer exists. 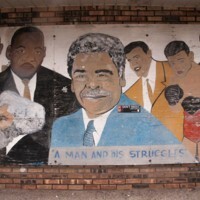 Titled A Man and His Struggles, this mural by Magic Fingers is in the Oak Park area of Chicago and depicts the first African American mayor of the city, Harold Washington, alongside Martin Luther King Jr., Jesse Jackson, and the antislavery leader Frederick Douglass. In 2016, artists updated the mural, to add the Pan-African flag along its bottom edge. 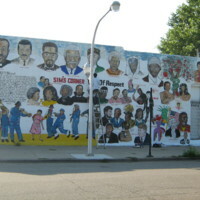 In 2009, Wardell McClain created a mural on South Champlain Avenue in Chicago, Illinois titled Sim's Corner Wall of Respect, that took its inspiration from the 1967 mural, Wall of Respect. It includes the faces of the abolitonists Frederick Douglass, Harriet Tubman, and Sojourner Truth as well as Martin Luther King Jr., Jesse Jackson, Malcolm X, Harold Washington, Elijah Muhammad, Nelson Mandela, Michael Jordan, Coretta Scott King, Marcus Garvey and Booker T. Washington. 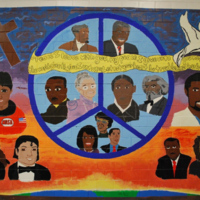 Titled Our Brothers and Sisters, this mural depicts figures of black history, including the abolitionist Frederick Douglass and also Harold Washington, Martin Luther King Jr., Booker T. Washington, Malcolm X, W.E.B. Du Bois, and Louis Armstrong.